When people think fall, leaves are generally the first things that come to mind. They’re beautiful as they turn from green to shades of yellow, red and burnt orange, but can start to become a nuisance as they start to drop and litter your landscape. So, it probably comes as no surprise that each year we receive calls from our customers about the leaves on their property as fall begins to wrap up. Because we believe in transparency and education, we decided to list some of the most common questions we get about Fall Clean Ups. Because every company operates a little bit differently, this article is going to be more focused on the way that we do things here at Schill Grounds Management. Nevertheless, if you live outside the Northern Ohio area and use another grounds maintenance provider, this information will still be useful as you get your property ready for the end of fall and colder the weather to come. What does a Fall Clean Up Include? 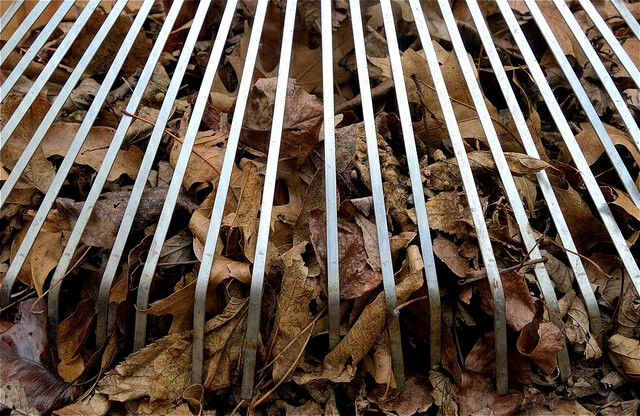 Fall Clean Ups go far beyond removing leaves from your landscape. We prune and cut back perennials and ornamental grasses as well. Most of these plants begin to go dormant in the late fall, and cutting them back during this time instead of in the spring ensures that their development isn’t hindered later during the growing season. For more information, check out this article on dormant pruning. Furthermore, many varieties of tall grasses die back in the winter, leaving dead debris that can make a mess on your landscape when it blows away in the wind. During Fall Clean Up, we also focus on protecting your turf, shrubs, and trees. We do this by applying fertilizer to the turf to assist in initial growth come spring. Clearing leaf accumulation from around shrubs will help prevent the growth and spreading of diseases. We also wrap evergreens to make barriers that protect them from the elements that the winter season delivers. Every step is taken by the Schill team to assure your property maintains its polished look throughout the season. Need more seasonal landscaping tips? Have we had our Fall Clean Up yet? 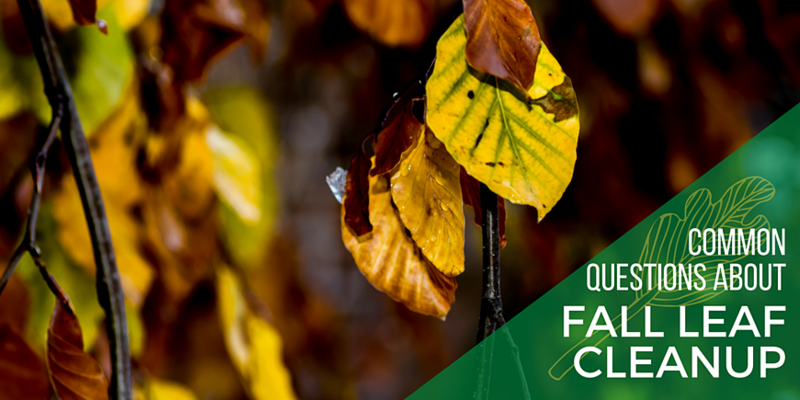 Depending on the types of trees on your property, leaves may continuously drop throughout the fall season. Our crews will pick up leaves when we’re servicing the property on their weekly visits, so often our clients will think their official Fall Clean Up has already taken place. This can be cause for anxiety, especially if they know that more leaves will continue to fall. As mentioned above, our official Fall Clean Ups are much more comprehensive than simply blowing leaves from flower beds. Additionally, we typically don’t schedule our Fall Clean Ups until around the last maintenance visit of the year, which typically takes place around the last week in November. This helps us make sure that we’re servicing your property after most of the leaves have already fallen, which allows us to make sure your property goes into winter looking its best. Can we have more than one Fall Clean Up? We sometimes recommend two Fall Leaf Clean Ups for properties we service with an abundance of trees. If needed, all additional clean ups are typically included in your initial contract. There are leaves in my property in January! Will you clean them up? Leaves will continue to fall in the winter as weather cools and heavy winds set in. This is especially true for late shedders like oak trees and pear trees. Later, snow can fall and cover the leaves, meaning that you might not discover them until the snow thaws, which may be as late as early spring. For the properties that use us as their year-round grounds maintenance provider, this isn’t cause for concern. When weather permits in the winter, our crews are out doing minor clean up services. This allows our customers to have landscapes that look their best all year round, and for us to have less work to do come spring. Scenarios like this are a win-win, but they’re only possible if we have a year-round contract with that property (i.e. they use for snow and ice management as well as landscaping). 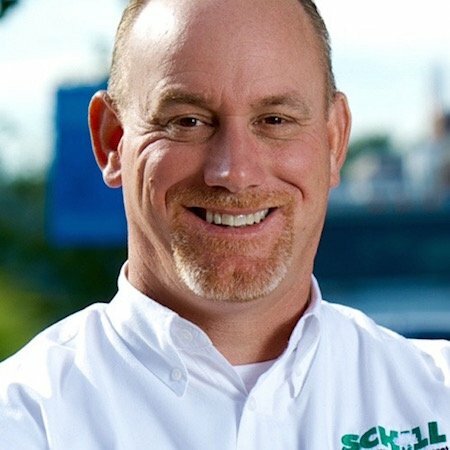 Schill is more than just a landscaping company. Whether it’s planting flowers in spring, mowing grass in summer, blowing leaves in fall, or removing snow and ice in winter, our crews have the training to make your landscape look its best all year round. As of fall 2017, we’re currently #1 in the nation for the number of ASCA certified employees, and we were only the second company in the state of Ohio to become ISO certified. If you live in the Cleveland or Northeast Ohio area, don’t hesitate to give us a call or drop us a line. If you’re looking to protect your property this autumn, download our FREE Fall Landscaping Checklist below.